Hawkman arrives with a Kryptonite mace, and proceeds to beat down Regime Superman until the Justice League arrives to save him, yet again. Batman makes off with Cyborg and prepares to digitally assault him in order to procure a "smoking gun". 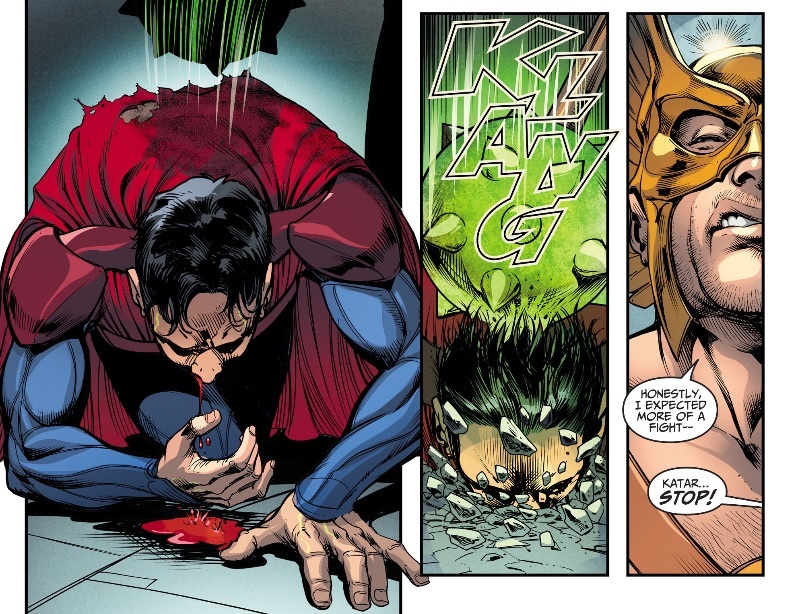 Story - 3: Injustice: Gods Among Us - Year Two showed Regime Superman defeating Ganthet, and Mojo on his own. Now, he cannot beat Hawkman without aid of the Justice League. In truth, he cannot contend with anyone on his own, and has had his fat pulled from the fire once too often since then. If this is purposeful, then readers may be able to look forward to a strong finish from Regime, however that's a dubious prospect. Injustice rarely shows the long term plotting and planning to make sure a dull turn for the principal character worthwhile. In truth, this entire issue needn't have occurred, for the result that was received. A beaten Regime Superman, an abducted Cyborg, and a dead Hawkman, that was easily accomplished last issue. The idea that Regime couldn't have just vaporized Hawkman on sight loses credibility, when he does exactly that a few panels later. Unless that was some heavy duty Kryptonite, the biggest loser for this issue, as usual, is the long-time reader. Art - 4: Santucci channels his best Neal Adams here. 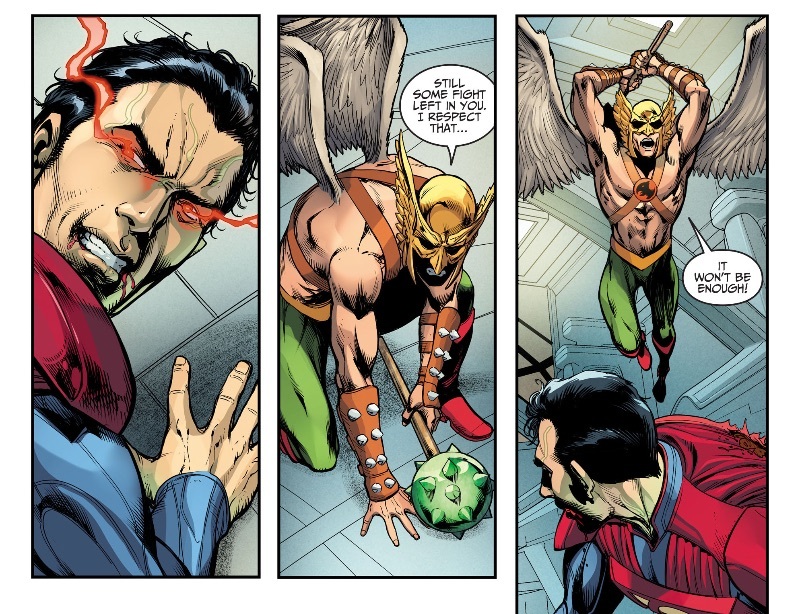 The beating that Regime lays on Hawkman is deliciously brutal, showing surprising savagery. Again, as too often, the story doesn't match up to the artist's strength. 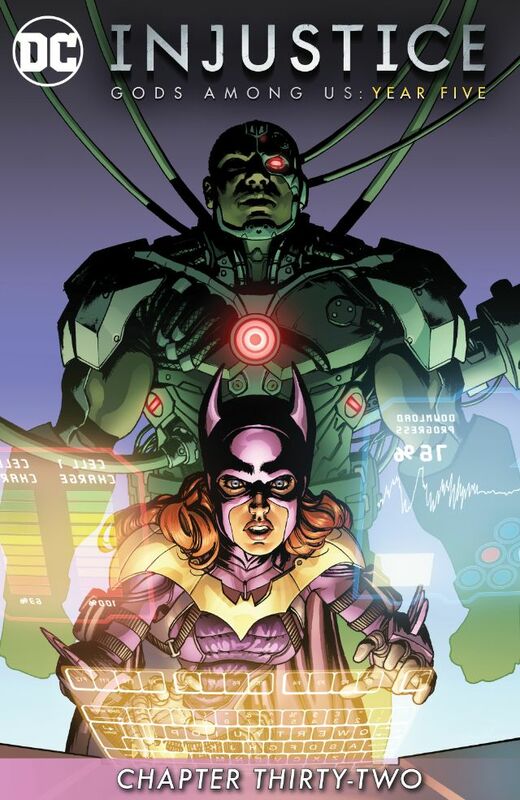 Cover Art - 3: A match up between Oracle and Cyborg would have been interesting. We got this instead.